Do you ever have one of those hair days where no matter what you do you look like a long-haired, fuzzy topped monster? Thursday was one of those days for me. No matter what I did, the back of my hair looked like a wild animal had been let loose and hosted birthday party right in the middle of my unruly curls. I was late for school and being ever so desperate, so I reached for the ever controversial glue of the hair industry. But, unfortunately, I forgot one important fact: Hair spray has a very strong smell, thus one should not bathe herself in it, no matter how desperate the cause. Thus, drenched in sticky spray, reeking of chemical, and still looking like a cavewoman, I ran out the door feeling quite ashamed of myself. Thoughts as scrambled as the eggs I eat for breakfast ran through my anxious mind. Surely if my hair looked bad I would never have any friends, the entire school would shun me, and I'd die a failure. But then, I caught myself. Why was I letting something as trivial as a bad hair day ruin my self esteem? No wonder the adversary tries to confuse us about our worth. As President Hinckley stated, women are God’s crowning creation and have a very important role in the Plan of Salvation. We have missions to fulfill. We have work to do. How likely am I to focus on others and serve people around me if I am constantly worrying about my hair and feeling horrible about myself? Not likely. The adversary knows this so he tries to keep all of us girls so worried about our looks and appearances that we don't have the confidence to serve and do those things that God would have us do. So you know what? Today I decided I was going to fight back. I'm not going to let bad hair days, clumpy mascara, baggy jeans, or any other fashion disaster get me down 'cause you know what? I'm important. I have value. 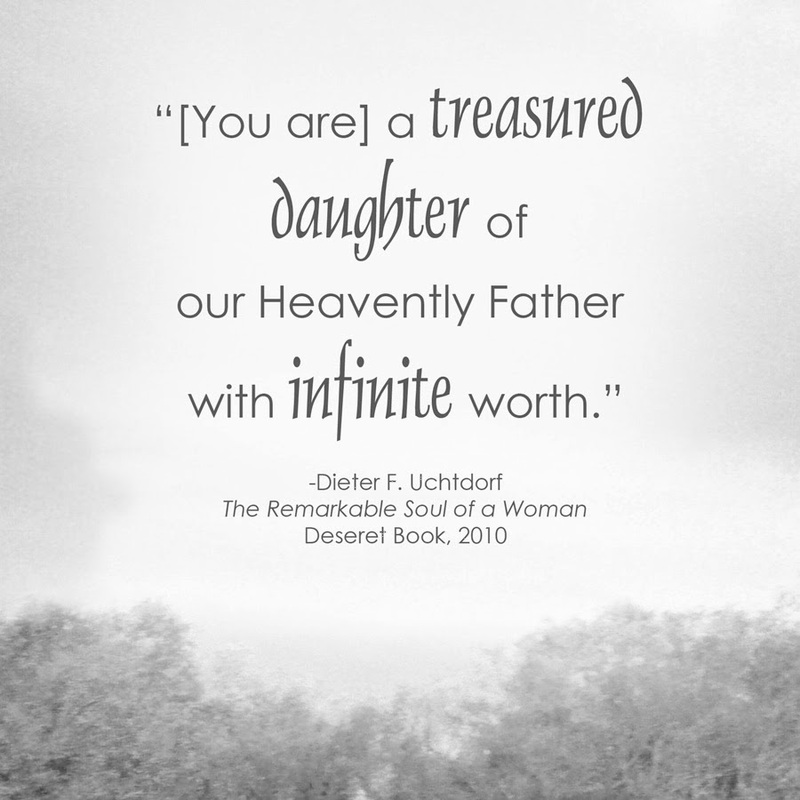 And I'm worth a whole lot more than physical appearances can ever amount to [even if I'm covered in hairspray] because I am a daughter of God. Nothing, not even rude peers and bad hair days can ever change that. Notice, he said infinite worth. Not some worth. Not partial worth. Not mediocre worth. Infinite worth-- Infinite worth that reaches beyond even bad hair days and stinky hair spray. As sons and daughters of Heavenly Father, we are all of infinite worth. No matter how we look, what we wear, or how crazy our hair is, He loves us. The most powerful being the universe values us. He cares about us. He cares about YOU. Never forget that. Oh my goodness, Sarah. I love love love your writing style! You are so awesome!! Keep at it!I love the fortitude of attitude you had to have a good day despite bad hair days, clumpy mascara, or baggy jeans. When one succeeds in having an awesome day despite the negative forces in action, one feels an immense sense of satisfaction. Thank you, Whitney! I really enjoy your writing style! Your blog is absolutely amazing and has been such a help and strength to me! I completely agree with your statement and love how you phrased that! Being positive even when everything is going wrong really does make a difference.